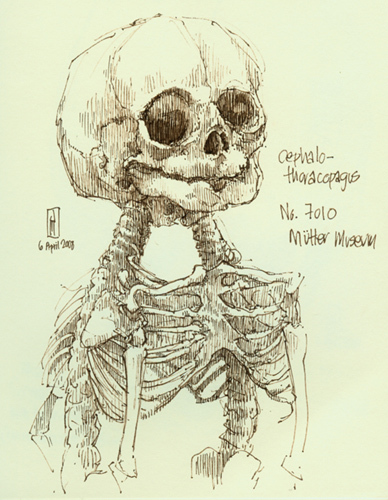 One rainy Sunday afternoon, I wandered over to the Mütter Museum of the College of Physicians of Philadelphia to spend some time drawing from the collection. The Mütter has one of the world's finest collections of unusual anatomical specimens. Among them is this skeleton of cephalothoracopagus conjoined twins. This particular specimen has long been a favorite of mine, and was even featured in a self-portrait several years back. Here two bodies join together at the torso and culminate in a single large head. The effect is rather like a couple dancing and holding each other so closely that they begin to merge together. This skeleton is at once eerie and hauntingly beautiful.